The Nieuwe Kerk is a landmark church in Amsterdam, the Netherlands. The Nieuwe Kerk (Dutch for "New Church") is located on Dam Square, next to the royal palace. The Nieuwe Kerk was started in the late 14th century when the Netherlands were still totally Catholic. When the bishop of Utrecht gave permission to build the church in 1408, the Oude Kerk ("Old Church") was already over a century old, and too small for the growing population of the city. 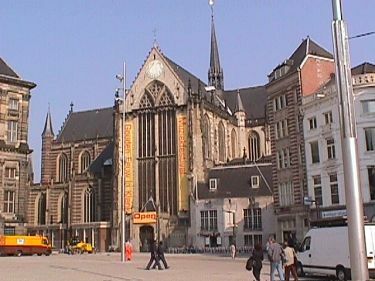 The Nieuwe Kerk was consecrated St. Mary and St. Catharine. Since the Reformation the Nieuwe Kerk has played a small role in Dutch history. Whenever a new Dutch monarch is crowned, the coronation takes place in the Nieuwe Kerk. Nieuwe Kerk is also the burial location for many of the Netherlands' famous military leaders. Famous leaders interred in the Nieuwe Kerk include Admiral Michiel de Ruyter, Commodore Jan van Galen, Admiral Charles Jacob Berghuis, and Jan van Speyk. The Netherlands, like the rest of Europe has become more secular in recent years, and as a result, the Nieuwe Kerk has a new more secular role in Amsterdam. In addition to being a tourist site, the Nieuwe Kerk also has exhibitions and classical music recitals.